Two out of three ain’t bad. The percent of new business start-ups since Katrina has exploded, far outpacing the national average, but the population has continued its shift out of Orleans Parish and government is still the highest job giver. 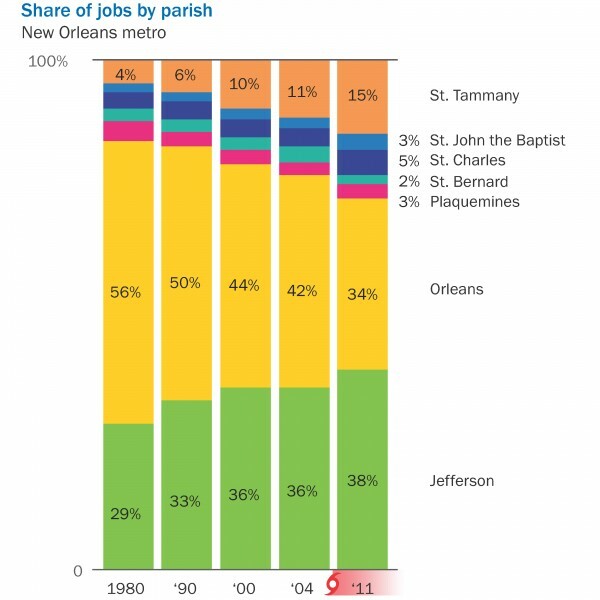 This article examines where the jobs are in the 10 parish region, how we are more productive than the US as a whole, how jobs are leaving Orleans Parish and where they are going. 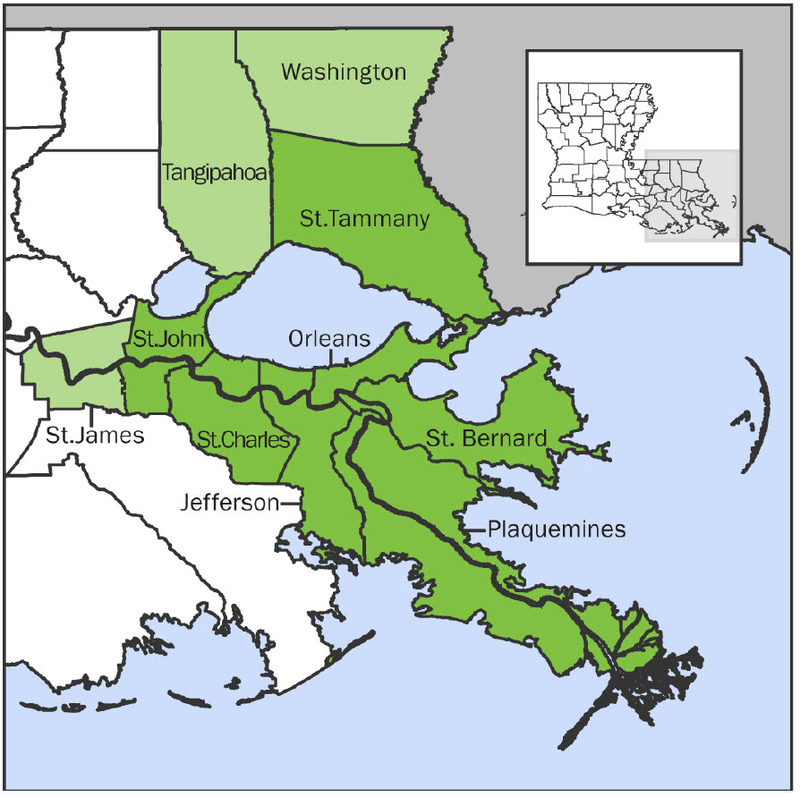 The New Orleans MSA ( Metropolitan Statistical Area) refers to the 7 parish area surrounding New Orleans. A MSA is an area exceeding 50,000 population with a high degree of similarity in social and economic traits. The 10 parish region includes St. James, Tangipahoa & Washington parishes since their economic traits are interwoven. 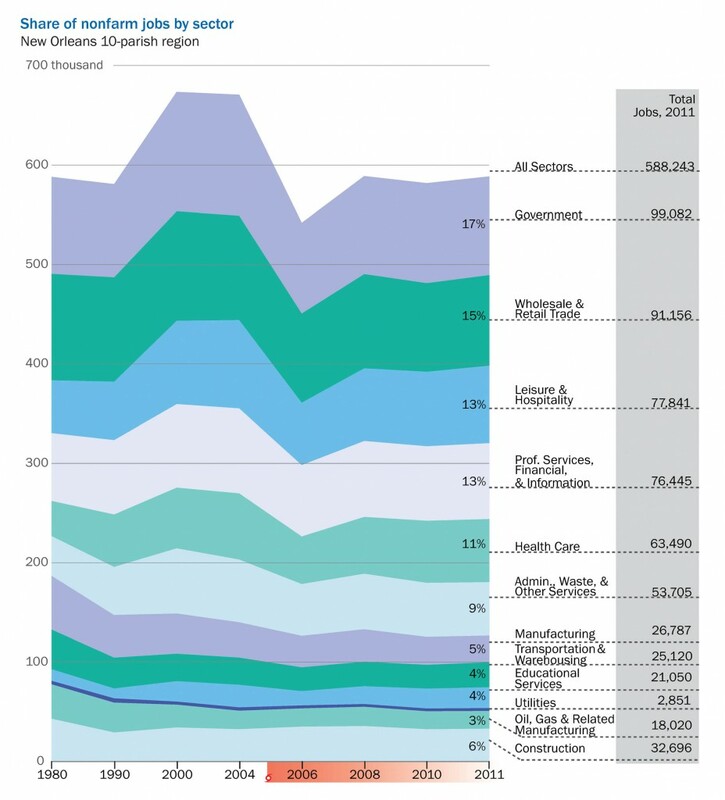 Since 2010, four sectors have lost jobs: manufacturing, oil, government and administration services, but government is still the major employer in the 10 parish region around New Orleans with 17% of the nonfarm jobs, followed by wholesale and retail trade at 15% and hospitality at 13%. Most of the jobs in Orleans and Jefferson Parish fall into three areas: Downtown, Elmwood Shopping Center and Lakeside Shopping Center. Notice the blank area in New Orleans East. 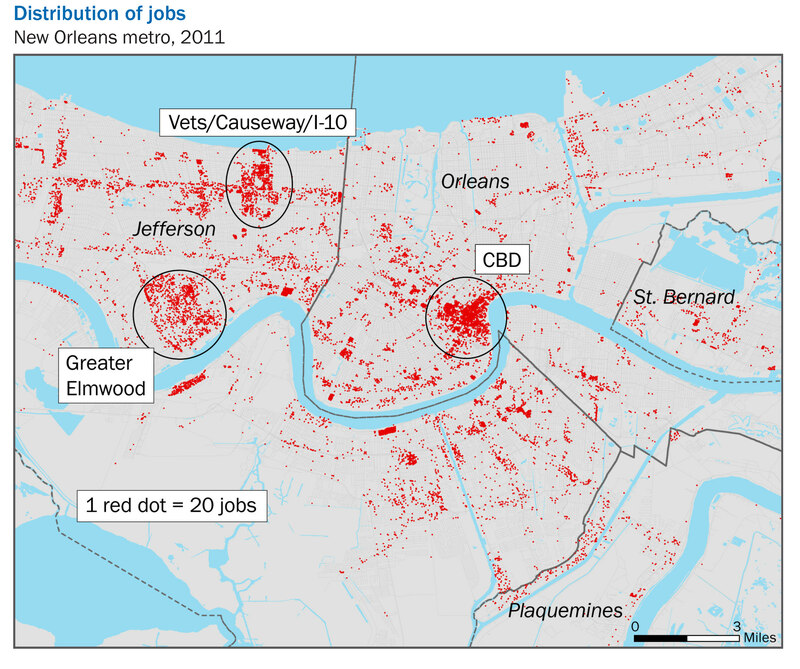 Jobs have been leaving Orleans Parish since 1980. Neither Dutch, Sidney, Marc, C. Ray or Mitch could make any difference. The jobs went to Jefferson Parish and St. Tammany. Looking at the rate of change, Orleans Parish lost 39% of its market share, Jefferson Parish gained 31% of the market share, and St. Tammany gained 275% market share. Job growth is a strategic driver because it leads to housing booms, new demand for office space, new warehouses to store the goods that industry produces and new retailers to sell to the new consumers. Gross metro product (GMP) measures the average value of goods & services produced by each job in the region. 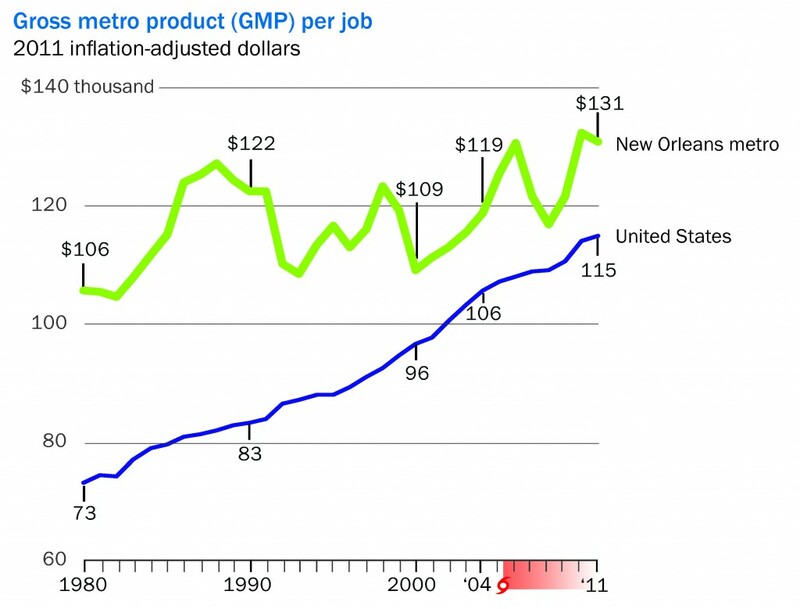 Since 1980, productivity in the New Orleans metro area rose 24%, but the US productivity during the same time period rose 57%. More recently though, the data show a change in trend: since the 2008 recession, productivity has increased far more than the national average. New businesses fled the New Orleans metropolitan area for the decade prior to Hurricane Katrina, but then things changed: existing residents decided after Katrina to start their own businesses and the influx of new residents to the area to help rebuild it led lots to stay and open their own business. 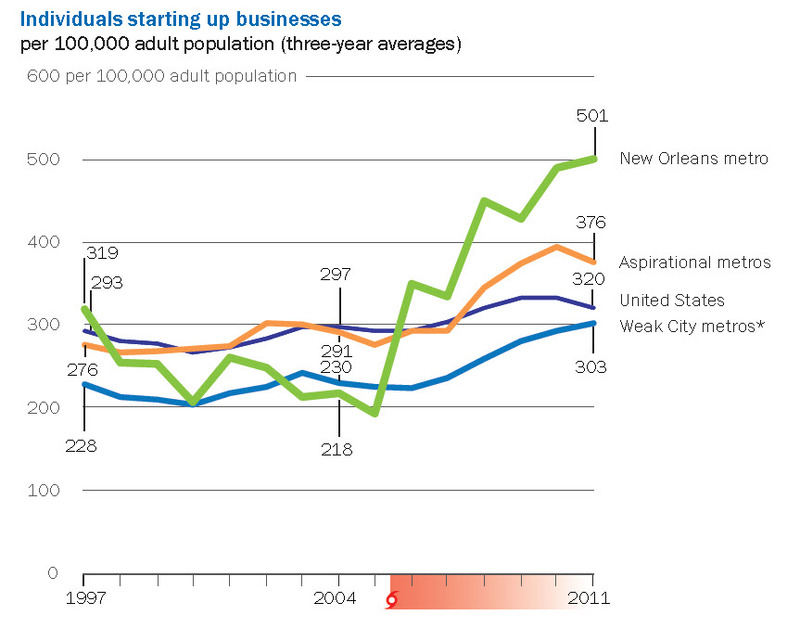 The percent of new businesses due to Katrina more than doubled, which far exceeded the national trend. For more information on demographics trends, see our article on Louisiana’s Economic Drivers.